neglect. An attempt to repair the problems in 1997 left our green totally unplayable. From 1970 - 1994 the Essex County Club was known to have the best green in the Eastern Division. The division at that time had over 25 clubs from Niagara Falls New York to Williamsburg Virginia. In 1978 and 1984 the Essex Club, along with NY Central Park and Trenton New Jersey, hosted the Annual ALBA National Tournament and hosted bowlers from South Africa, England, Scotland, Australia, along with United States bowlers from as far away as Hawaii. Every year one of the 9 major Eastern Division tournaments was scheduled at Essex until the green became unplayable. Essex Green in 1999 which became unplayable due to crab grass and lack of regular maintenance. 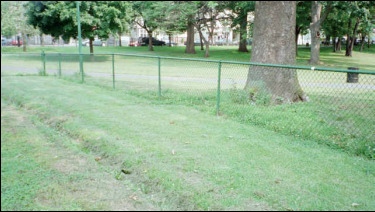 In 2004 the Essex County Parks Department requested that they install an artificial playing surface to reduce maintenance costs. Though the green has suffered some problems since its installation, we currently have an exceptional playing surface and will host the Northeast Pairs Play-downs and Division Open in 2012.
the UK to arrange bowling matches at greens in the United States. As Essex County Lawn Bowling Club is the only active club in New Jersey it is a favorite destination for many of our foreign visitors, many of whom have been to NJ before. Our green is well known overseas thanks to the play of some of our members. Skip Arculli, Duncan Farrell and Michele Arculli have represented the United States and Essex County overseas on numerous occasions. Skip Arculli was a Gold medal winner at the 1982 World Championships held in Scotland. They are still active in the sport at the local and international level. Club President Colin Smith has represented the US against Canada on 2 occasions. The Essex Club still holds the United States Challenge Cup which it has successfully defended on numerous occasions. The green is a sand filled artificial surface of 120’ by 108’ which is surrounded by a sand filled ditch 8 inches wide and 5 inches deep. Around the green is a standing area of about 4-6 feet and the entire bowling area is enclosed by an 8’ high fence. The green is also equipped with lighting to enable play in the evening. The club has a building adjacent to the green which is used as a clubhouse. It has facilities for both men and women and is used to house bowling equipment and lockers for members to keep their bowls. Bloomfield, NJ – Essex County Executive Joseph N. DiVincenzo, Jr. welcomed the sport of lawn bowling back to Essex County on Saturday, August 18th when he officially dedicated the refurbished lawn bowling green facility in Watsessing Park. After being played in the park for generations, the lawn bowling facility was closed five years ago because of maintenance issues. sport of lawn bowling,” he added. Players returning to the Essex County lawn bowling green on Glenwood Avenue in Bloomfield will compete in a state-of-the-art facility that has a synthetic grass playing surface, new fencing and a renovated field house. The project cost $205,000 to complete and was part of a $902,000 project that also included upgrades to two basketball courts, renovations to the historic bandstand and repairs to restroom facilities in various field houses. The other work was completed in July before the Watsessing Heights Neighborhood Association and Watsessing Park Conservancy hosted their inaugural Gala Independence Day Celebration at the Bandstand on July 3rd. financial constraints. The facility eventually was closed. The Watsessing Park renovation project was funded with $500,000 from a 2003 Multi-Parks Improvement grant from the New Jersey Green Acres Program and $500,000 in matching funds from the Essex County Open Space Trust Fund. The architectural firm of Remington and Vernick received a $73,615 contract to design the project. Zenith Construction was awarded the $902,000 contract to do the construction work. the New Jersey Green Acres Program. It is scheduled to receive a $500,000 grant that will be used to fund future improvement projects. addition, upgrades were made to the drainage system, park trees were trimmed, and the restrooms and senior room were painted. Essex County also invested about $220,000 to install rubberized safety surfaces in the three playgrounds in the park last year.